Usually, when I run a race in San Francisco I spend the night. Since I now have a baby, traveling looks a little different. I, therefore, made the 2.5-hour drive home Saturday evening and then turned around six hours later to make the drive back to San Francisco. What’s nice about driving to a big city at 3:30am is that there’s virtually no traffic! When I arrived to my prepaid parking space in San Francisco, I had to wait since they were out of parking spaces. How does a company (such as Spot Hero) presell you a parking spot, but then fills up the space leaving you without a parking spot? Fortunately, the attendant found a few more spaces in an adjacent lot. Parking in San Francisco can be difficult to say the least. Rock n Roll San Francisco changed their starting line this year. Three days prior to the event, an email went out to all participants saying that there'd be wristbands for everyone to wear. At first, the wristband seemed like a cool idea, but in actuality, I’m not sure how great it turned out to be. 1) The bands were small and felt really tight on the wrist. Who wants to be wearing something tight on their wrist while running? 2) The colors were not synched properly. A group of people all in the same corral had different colors showing on their wristband. 3) The email said that the wristbands would “enhance your musical experience”. How so? I don’t recall experiencing any enhancement while out on course. With the delay in finding a parking spot, I barely made it to the starting line after stopping to use the restroom. In the over 6,000 runners and the different start line procedure, I was able to locate my fellow Pro Compression people since we were all wearing the same California sock. We lined up and away we went! Three weeks prior to Rock n Roll San Francisco, I ran the Shamrock’n half marathon with a time of 2:57:04. I ended up finishing Rock n Roll San Francisco with a time of 2:49:07. I was proud of this speed increase because I gained 142 feet at Shamrock’n and 1,471 feet at Rock n Roll San Francisco. I also stopped several times to take pictures along the course of RnRSF. 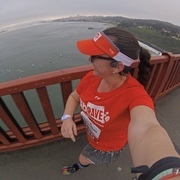 Some of my top highlights of RnRSF were running over AND under the Golden Gate Bridge, running in the Pier 39 area, and meeting up with so many of my running friends. Overall, I'd recommend this race. I’m baaaack and it feels sooooo good! Although this was my second race postpartum, this was my first race in which I was able to vary my pace based upon how I was feeling… faster or slower. 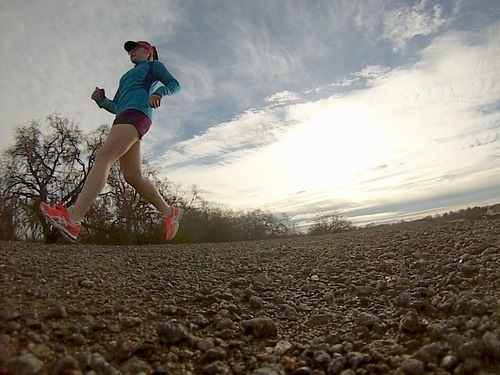 In my pre-race post, I mentioned that I expected to run an average of 14-minute miles. Well, I smashed that! Race morning started with waking up at 4:15am. I pumped a bottle for my two month old baby, got ready, and was out the door by 5:03am. I am notoriously bad at checking my fuel tank on a regular basis. (Don’t ask my husband about the time I almost ran out of gas while trying to evacuate our city that was at risk of flooding or the time I nearly ran out of gas in the middle of the Mexican jungle.) One hour into my trip my car alerted me that I needed to stop for gas. I found the nearest gas station and it was raining hard! I really thought that I would be running in the rain. Fortunately, the sky cleared up beautifully for the race! The race started in waves and I was wave two. I thought the starting area of the race was organized, well laid out, and entertaining. There was a DJ who was elevated high up close to the starting line who played some great music to get us all hyped. Two of my favorite parts of the course were the Memorial Mile and the Mariachi Mile. For the Memorial Mile, I was running low on energy, but once I saw those veterans and activity military members holding up flags and cheering us on, I felt reenergized! As for the Mariachi Mile, this was towards the end of the course and was also quite energizing. You can see the various Mariachis in my race recap video. Before I knew it, we were rounding the bend to Santana Row and the race was done! The finish area was well organized and well stocked with volunteers who were passing out water bottles, bananas, and bags with a couple of snacks. The finish zone also had quite a few vendors along with picture opportunities. Once I finished walking around the finish zone, I made my way to the free buses to drive me back to the starting line. It was easy to navigate around the finisher zone and to the buses since the signage was easily readable. Even the bus area was well organized with lines set up and plenty of volunteers. Would I return to run the San Jose 408k? Yes, absolutely! Would I recommend it to a friend? Yes, for sure! I was really looking forward to running the Giant Race in San Francisco! This race definitely did not disappoint. It’s difficult to believe that the race was already two weeks ago. I arrived at the race start at about 6am. I was able to meet up with Sarah, pick up my bib & other goodies, take what I didn’t need back to my car, and then make my way to the starting line. I had not realized how large of a race this was. I was glad I had given myself extra time and had arrived at the starting line early. The race both started and ended at AT&T Park, home of the San Francisco Giants. I had never been to the park before, so this was certainly a highlight of mine. I didn’t find a bathroom until close to the turnaround at mile 6.5. I basically walked the whole rest course (from mile 4 to the end, mile 13.1). Besides feeling pregnancy discomfort in my belly, I also struggled with feeling discomfort in my feet during the race. I also experienced chafing despite wearing capris. My chafing was so uncomfortable that it made walking back to my car after the race quite unpleasant. Overall, I was quite impressed with the race. Clear course mile markers, many volunteers out on the course to cheer on the racers as well as direct us, well-stocked aid stations, and organized starting and finishing festivities. 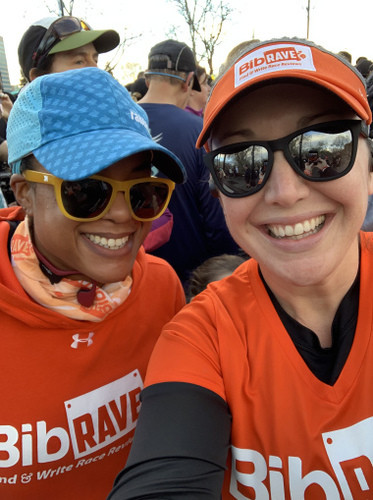 A few highlights of the finish line included finishing at AT&T Park field, having access to a photo booth, and being given a bag in the food area to stash all of our goodies. 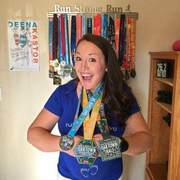 At 29 weeks pregnant, I knew going into the race that my time wasn’t going to be anything record breaking. What I am proud of is the fact that I didn’t finish last, I ran some of the course, and I finished. At first, I was just going to run the OakTown half marathon on Sunday. 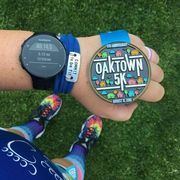 Then, when Oaktown Half announced that they were adding a 5k and participants who ran both the 5k and half marathon would get a challenge medal, I was in! The 5k was at 4pm on Saturday and the half marathon was at 7:30am on Sunday. Some of the highlights of the 5k were seeing the cool mile markers, the artwork scattered throughout the city, and the post-race celebration that included food trucks, music, and various booths! Oh! And also running into some awesome runnings friends… Pavement Runner and David of FitFam6! As for my finishing time for the Oaktown Half 5k, I knew going into the race that it wasn’t going to be fast. 1) I haven’t really been training 2) I am over 6 months pregnant 3) It was nearly 90 degrees Fahrenheit at race start time! Overall, I am proud of my 5k performance. I ran some, I walked some. There were no aid stations during the 5k course, but I already knew that since it was posted on the website. It was no big deal to me because 1) it was a short 3.1 miles and 2) I carry my handheld water bottle. A great race overall and one I'd run again! Initially, I had booked a hotel close to the Oaktown Half start/finish line, the Frank H Ogawa Plaza. Since my husband decided to stay home for the weekend, I chose to cancel the hotel. To get to the Frank H. Ogawa from my house, it was a two-hour drive one way. It may seem like a lot to drive four hours on Saturday and then drive another four hours on Sunday, but to me, it was worth it. I arrived at the half marathon at 7:00am. The race started at 7:30am. Since many parking garages were not open yet, I ended up parking on the street… for free! Shortly after walking to the starting area, I ran into fellow BibRave Pro Janelle. I then waited in line to use the porta potties. Shortly thereafter, I headed to line up in the starting corrals. Next thing I know, a lady came up to me and said hi. It was another BibRave Pro Rory! Before I knew it, it was time to start the race! This time around, I decided not to do timed run/walk intervals. Instead, I decided just to just go based on how I felt at the time and try my best to keep a consistent 13:45 pace (a 3 hour half marathon finishing time). By mile 2, I already had to go to the bathroom. I approached an aid station at about 3.5 miles and asked when was the next bathroom. I thought the lady said, “At mile 5,” but two gentlemen who were running around me said, “I think she meant in another 5 miles.” At mile 5, my heart sank when there was no bathroom in sight. I ended up spotting a restaurant and ran inside to use the toilet. A HUGE shout out to the Fat Lady restaurant. Thank you for allowing a pregnant woman to use your toilet! I was fairly successful in keeping my 13:45 min/mile pace until about mile 9 when I started having an uncomfortable feeling in my gut. Intestines? I decided to keep on moving forward one step at a time. Can you tell which of the below pictures are from the beginning of the race and which one is from around mile 9? As far as scenery is concerned, my favorite part of the race was the few miles around Lake Merritt. Anytime I can run with a water view, is a good run! A fire was lit at mile 12 knowing that the finish line was drawing near. At mile 12, I also spotted two gentlemen ahead of me. We first met at mile 2 and went back and forth for most of the race. I caught up to them with a smile on my face and said, “We’re almost done!” I ended up running the final mile with an overall pace of 10:38… my fastest mile of the whole race! Overall, a fantastic race and definitely one I’d do again. Thank you Oaktown Half for an epic weekend! I hope to see you again next year!